Over the weekend I went to il Bistro. A quaint, little Italian restaurant hidden in Pike Place Market. I have wanted to go try this place out for years. It was well worth the wait. I had the best lasagne I have ever tasted! 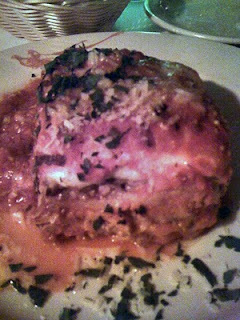 Lasagne is one of my favorite dishes, and I have had it hundreds of times, and this was the best so far. The menu says their Lasagne is traditionally prepared with ground veal and lamb with imported Italian cheeses. The veal and lamb were cooked perfectly, and the imported Italian cheeses are what made this a perfect Lasagne. If I wasn't already stuffed from eating my Lasagne, I could have easily eaten another serving. I higly recommend trying their Lasagne. I want to go back and try some of the other items on their menu that looked just as good!